Vintage Glamour with a fashion twist!! Vintage for Everyone - Everyday!! 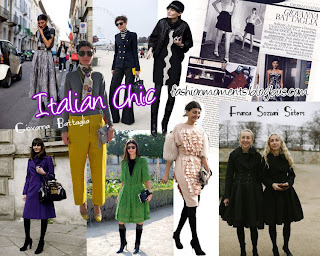 I was catching up with my favourite blogs and one of the first on my list is always The Sartorialist and to my joy I saw that Scott had posted a picture of Giovanna Battaglia Fashion Editor of Italian Vogue and stylist. I have decided to do a regular "Modern Style Icon" post with images of those people who I think deserve to be in this hall of fame. One of the first had to be Giovanna. She always looks so stylish and glamourous. She puts a twist on classic and takes a risk with fashion. Some of the combinations she comes up with shouldn't work but she manages to make it look amazing!! Giovanna has got fabulous personal style and is obviously very confident in her choices. She has a strong sense of self. I know that she has a designer wardrobe at her fingertips but a lot of her pieces are such classics and really easy to put together for us lesser mortals without the high end price tag. The simple grey polo neck that she pulls out time and time again adding a funky skirt or shoes to make the outfit pop. Or the clash of colours and use of accessories is something we can all attemp to replicate with our own wardrobe. So here's to Giovanna a worthy first on my "Modern Style Icon" section!! Logo Simon Pritchard - Artbeat.